Beauty and the Beast is a tale as old as time, a story that gets told to every boy and girl and now it’s available to enjoy in slot form. Yggdrasil has turned the classic tale into a video slot that gamblers of all ages can enjoy. The slot is loaded with bonus features such as Free Spins, 3 Bonus Servants and a Golden Bet option. Beauty and the Beast is a 5 reels, 3 rows and 20 bet lines video slot powered by Yggdrasil. The slots start out with a beautiful cinematic intro video of you (Belle) entering the castle. Since its release earlier in 2017, players are flocking to this slot for the nostalgic experience. The slot is uniquely designed and keeps all iconic elements from the original tale. Players can even look forward to an exclusive Golden Bet feature to increase their winnings. Beauty and the Beast is a beloved story that gets passed on from generation to generation. This traditional fairy tale written by French novelist Gabrielle-Suzanne Barbot de Villeneuve was published in 1740 and turned into an animated film in 1991. Earlier this year the film was remade starring A-list actors such as Emma Watson. Just before the release of the film, gamblers were treated to the release of this particular slot version. 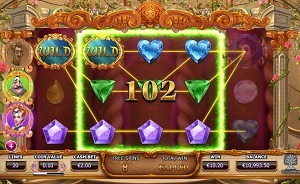 The slot can be played on all devices from desktop to mobile and tablets. Players can spin from as little as 0.20 to a maximum of 100 per spin. The coin values range from as little as 0.01 per line to 5 per line. Players also have a chance to win an amount of 100,000 coins in one single spin. Beauty and the Beast comes fully loaded with a variety of theme structured bonus features that add to the immersive gameplay. The wild of this slot is the mirror with “wild” written on it and it replaces all other symbols except the scatter. The 3 Bonus Servants features can be triggered randomly during any base game spin. These features will also be active during the free spins feature to increase your winnings. The Butler will nudge one reel up or down to provide you with the best possible outcome. The Chef will give you the synchronised reels feature, the Chef ensure that the three middle reels are synchronised to show identical symbols. And The Maid will turn your spins into wins by adding 2 to 4 extra wilds anywhere on the reels. 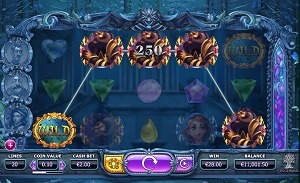 When 3 or more rose scatters land on your reels it will trigger the free spins feature. You’ll get 10 free spins during which you can choose any of the 3 Bonus Servants to be present on every spin. The free spins can be retriggered and if it happens you’ll have the opportunity to choose another servant for that set of spins. The Golden Bet feature can be used at any point during the game. All you have to do is click the golden button to the right of the spin button. If you click on it you’ll be betting a little extra to get better features during your spins. Boost helps you win more free spins as you start with two of the servant features instead of one. For this feature, you’ll have to spend 5 extra coins. To get the Nudge feature you will have to spend 15 coins extra on your spin. This feature will help you enter the free spins bonus game more often if there is a hidden scatter that can be triggered. The Boost & Nudge feature costs 30 coins extra per spin and awards you with the advantages of both the Boost and Nudge features. It might be a little heavy on the bankroll but the rewards are definitely worth it. Whether you are a cynic or dreamer, living happily ever after remains a secret fantasy. With fairy tale themed slots, players get to indulge in the dream while cashing in at the same time. 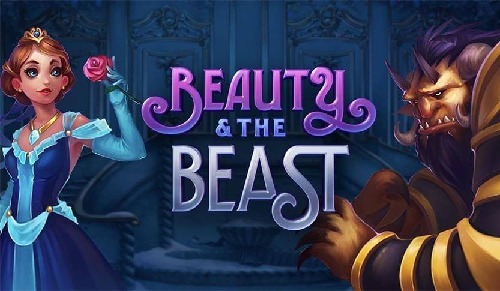 With its lavish visuals and enchanting soundtrack, Beauty & the Beast is one of the most popular fairy tale themed slots. Yggdrasil might not be the oldest gaming supplier in the industry but they have done a spectacular job at making their mark. The supplier has been known for creating video slots with well thought out themes, the highest quality graphics and a soundtrack that whisks you away to a fantasy wonderland. Beauty and the Beast is a great example of the extensive work and detail that goes into each and every slot they create. 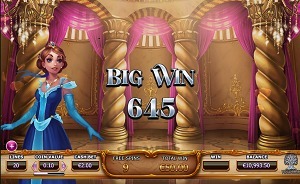 Fairy tale themed slots have become quite popular among gaming suppliers. Very few can pull it off as well as Yggdrasil. The only other competitor that has come close is NetEnt, the industry-leading gaming supplier. 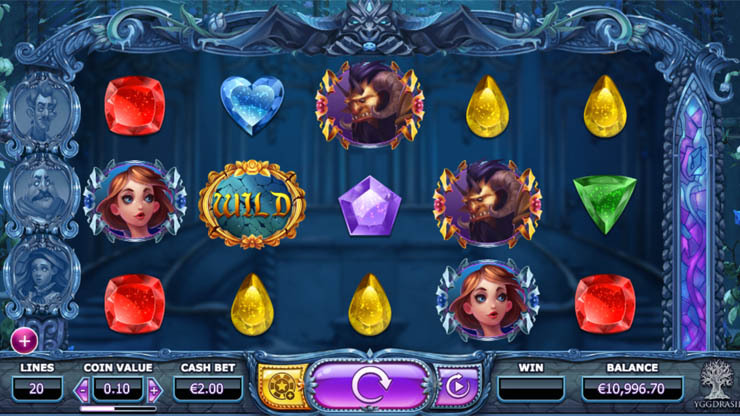 NetEnt created a series of slots called the Fairytale Legends. In this video slots series, they released slots like Hansel and Gretel and Red Riding Hood. 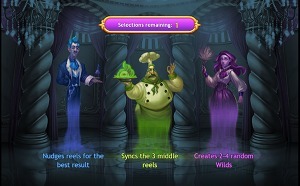 If fairy tale themed slots are not up your alley try the mysterious Holmes & the Stolen Stones slot. This slot is jam-packed with features and fun riddles. 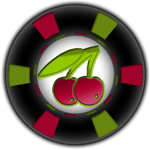 Mobile slot players will be delighted to know that this graphic masterpiece is available on all iOS and Android devices. The HTML5 software ensures that the gameplay is smooth and the graphics uninterrupted. The only thing that changes when shifting from desktop to mobile device is the placement of the buttons. This clears up the screen to help you get the best possible gaming experience from this slot. Beauty and the Beast is a nostalgic masterpiece with high quality graphics and spectacular features. The beautifully designed characters and the classic soundtrack bring this tale to life. While being enchanted by the beauty of the slot you too might find your happily ever after.